It's that time of year again! It's time for your tire-switch over! 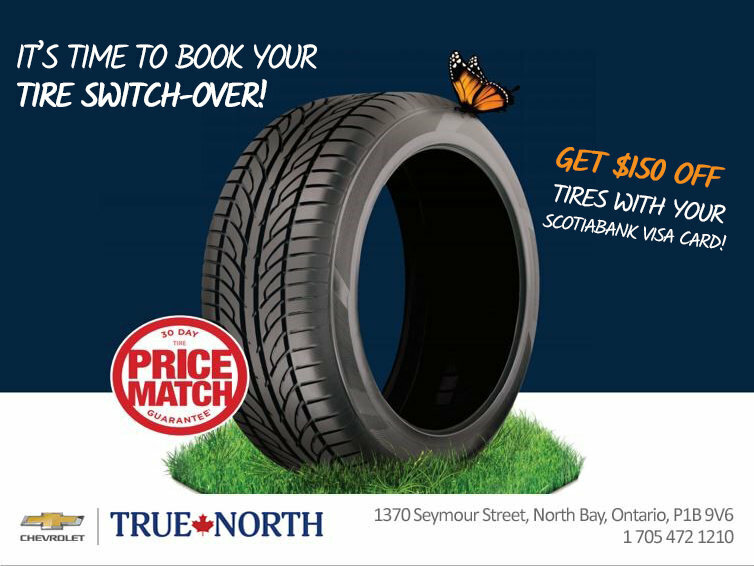 On now until May 31st receive $150 off any set of tires with your GM Scotiabank Visa card! PLUS. - $40-$50 instant rebate on any Bridgestone/Firestone, Pirelli tires and up to $75 in mail-in rebates on Michelin, Uniroyal, and Goodrich! - AND no interest and no payments for 90 days when you spend $250 or more! Don't have a GM Scotiabank Visa? No problem! It's easy to apply in-store and only takes a few moments. and Scotiabank will issue a temporary shopping pass to you through email within moments. Don’t forget, the up 5% GM earnings towards the purchase of your next vehicle. HURRY IN! Spots fill up fast! $150 off your next set of Tires expires May 31st, 2019!